For the past 2 weeks, I've been using this Pure Smile Choosy Lip Pack in Peach in my lip care routines. So I thought I'd share my thoughts on them with you guys today. I've tried a few Pure Smile Choosy lip masks by now and I've been left with mixed feelings on them as a whole. So far, I've had better luck with their masks from the Pearl line than masks from their Original line. It was getting to the point where I was going to give up on the Original line all together, but then I tried the Peach mask and it changed everything. Okay, maybe it's not that dramatic but the Peach masks, although also from the Original line, actually turned out pretty good. 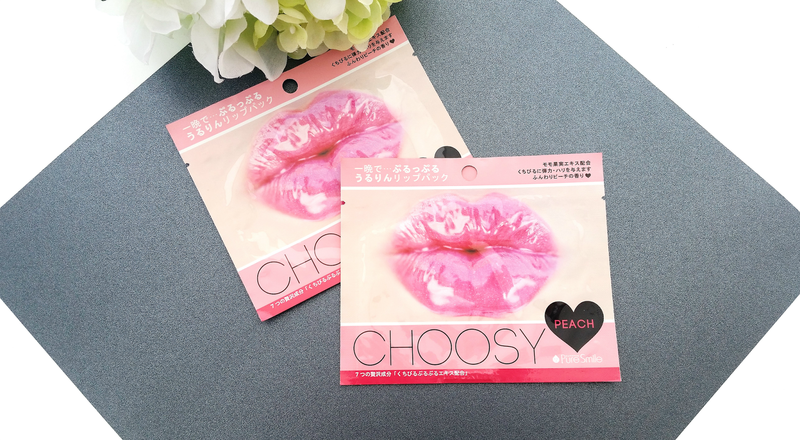 Product Description: The Pure Smile Choosy Lip Pack in Peach is a peachy and moisturizing hydro gel lip mask. It's formulated with ingredients like peach extract, honey extract, collagen, jojoba seed oil, ceramide, and more to soften the lips while hydrating it. To Use: Cleanse your hands and lips first. Take the mask out of the package and apply it onto your lips. Leave the mask on for 5 to 30 minutes, then remove and massage the remaining essence into the skin lightly. Tip: Lip masks are most effective when used after a bath/shower. Ingredients: Water, glycerin, butylene glycol, ceratonia siliqua gum, xanthan gum, hydrolyzed collagen, prunus persica (peach) fruit extract, punica granatum fruit extract, honey extract, vaccinium angustifolium (blueberry) fruit extract, simmondsia chinensis (jojoba) seed oil, beta-glucan, ceramide 3, chondrus crispus (carrageenan), piper methysticum leaf/root/stem extract, vitis vinifera (grape seed oil, sodium hyaluronate, allantoin, calcium lactate, polyglutamic acid, niacinamide, calcium pantothenate, sodium ascorbyl phosphate, tocopheryl acetate, pyidoxine HCI, maltodextrin silica, sodium starch octenylsuccinate, PEG-60 hydrgenated castor oil, fragrance, methylparaben, phenoxyethanol, disodium EDTA, iron oxide. Like in my previous Pure Smile Choosy lip mask reviews, I've highlighted the ingredients that are unique to this mask only. 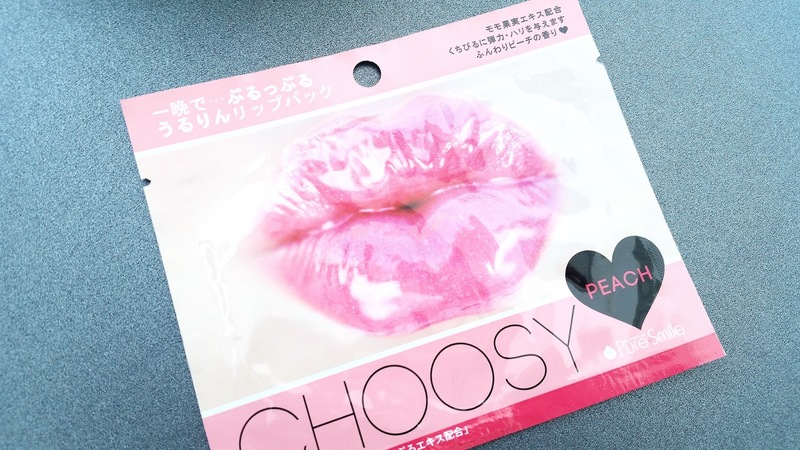 Packaging: The packaging style for the Choosy's Original line is pretty much the same. The same puckered lips, the same design layout, and the same instructions on the back. The differences that differentiate each mask is their main color and their information. 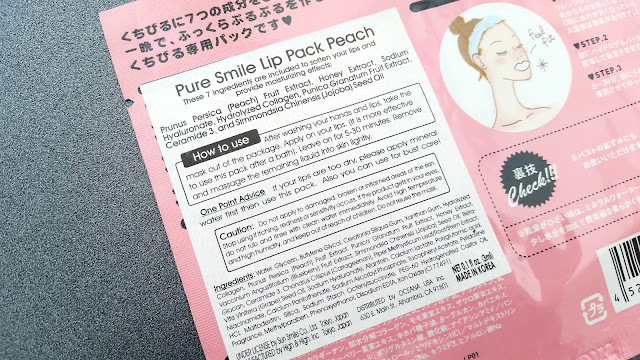 Pure Smile's Choosy lip masks have Japanese information and instructions printed on them. However, some shops have these white stickers (see above) that will have information and ingredients in English, which is very handy. Inside, each lip mask comes with a protective plastic casing and a white plastic sheet to keep the mask's shape. Scent: I was slightly disappointed by the scent. I knew it would have that typical hydro gel mask scent that every Pure Smile Choosy lip masks has, but I was hoping the peachy scent would overpower it. Unfortunately, it doesn't. I was able to pick up a super light peachy scent but it's mainly the hydro gel scent that's dominating. However, when the lip mask is applied to the lips, the scent dissipates fast and it becomes not so noticeable after a while. Color: The Peach lip mask has a peachy color. Texture: I've come to the conclusion that all Pure Smile Choosy lip masks have the same texture, which is expected since they use the same base ingredients. Their masks are like your typical hydro gel masks but just the hydro gel part and no inner mesh/sheet to hold it. This makes it really flexible and adheres to the lips nicely. I secretly wish there are face masks like this because the fit would be amazing! 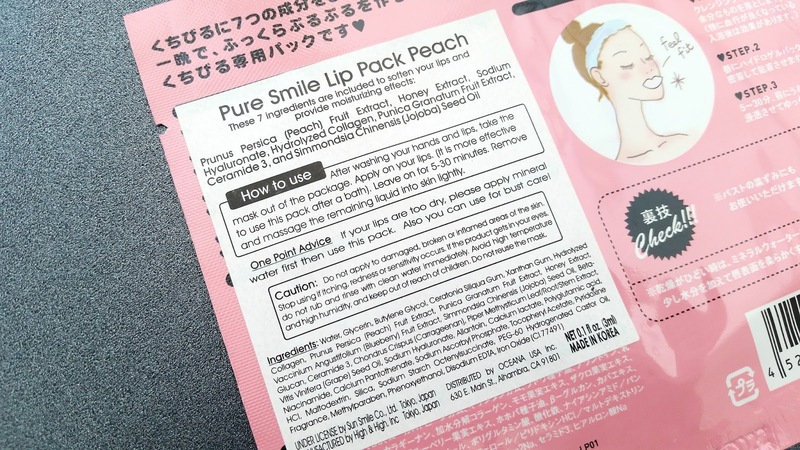 Michelle's Thoughts: I was very happy with these Peach lip masks from Pure Smile. They aren't 100% perfect but they performed much better than the Milk and Fruit masks from the Original line. Scent wise, it's still a hit or miss for me and I think I just have to get used to the fact that the strong hydro gel base scent isn't going anywhere anytime soon. The Peach mask's effects actually came close to the Pink Pearl and Purple Pearl masks, which is amazing because so far I liked those 2 the most! The Choosy Peach lip masks were really moisturizing and they left my lips feeling soft and smooth as well. The lip mask was able to soften up the dry areas on my lips and provide nourishment to my lips too. Although the instructions suggests to leave the mask on for 5 to 30 minutes, sometimes I actually leave it on for an hour or more. I know, that a lot of time but hear me out. There's a method to my madness. The reason why I leave my lip mask on for almost double the time is because (1) there's still plenty of moisture on the mask after 30 minutes, so why waste, and (2) because by leaving the mask on longer you can actually get a plumping effect out of it. The effect will vary per person and can depend on the time you leave the mask on. I found the most optimal time for me is between 60 and 90 minutes. At the 90 minutes mark, the lip mask is getting thinner and drier but not completely dry yet. You wouldn't want to wait for the mask to dry completely as it can be stuck to your lips like how a dry sheet mask would be stuck to your face. I usually do this before a special event or a date night, etc. The effects usually last 6 to 8 hours but sometimes more, which is nice. Since I'm not always a big fan of lip plumper, this has become a great alternative! Final Thoughts: I liked these Pure Smile Choosy Lip Pack in Peach. They did just as they promised and left my lips soft, smooth, moisturized, and plumped. The lip masks are big and super flexible, so they always fit well. Plus they are super affordable as well. I only use it once a week (and for special occasions) but it wouldn't break your bank if you want to use it more often. Would I repurchase them in the future? I'm thinking about it. I actually want to get the 20 pack I saw on Yesstyle. The 20 pack comes in a cute lip container and it has a spatula as well. It's actually a lot cheaper than getting the individual lip masks too. I do hope they come out with 20 packs for other flavors as well. Do I think these are worth a try? Yes I do! Aside from the scent and aftertaste (don't lick your lips after), these Peach lip masks are great and offers everything it promises. They are great for lip care routines, special events, and they even make great gifts. If you need a lip mask that can moisturize, soften, smooth, and possibly plump the lips, than definitely check these out! Disclaimer: These products were purchased by me. All opinions are honest and my own. This post contains some affiliate links, for more information check out the full disclaimer.